City of Glasgow College emerged the big winner from Skills Show 2015 in Birmingham as it claimed eight medals, including four golds — the most for any provider. The Saturday closing ceremony, which marked the culmination of national skills competitions finals, also saw the announcement of most of the long squad (pictured above) ahead of the next WorldSkills competition in Abu Dhabi in 2017. City of Glasgow College’s four gold medals were in beauty therapy (body), confectionery, culinary arts and health & social care. It also won two silver medals, in network systems administrator and confectionery, and two bronzes, in culinary arts and network infrastructure technician. North East Surrey College of Technology was next up with three golds before Northern Ireland’s Southern Regional College and also North West Regional College were tied on two golds with Wales’s Coleg Cambria and also Coleg Sir Gar, Scotland’s New College Lanarkshire and England’s Mid Kent College and Highbury College Portsmouth. Around 700 people attended the awards event, held at the Birmingham NEC, which had earlier featured opening speeches by Dr Neil Bentley, chief executive of organisers Find a Future and Peter Lauener, chief executive of the Skills Funding Agency and the Education Funding Agency. “As the UK’s official delegate for WorldSkills competitions I know I’ve seen young people with the potential to succeed in the heat of international competition, when the next WorldSkills event is held in Abu Dhabi in 2017,” said Mr Lauener. “Every competitor I’ve seen this week in Birmingham knows that they have the skills which will give them a good career,” he said. The names of most of those who will make up Squad UK were also announced at the end of the night. 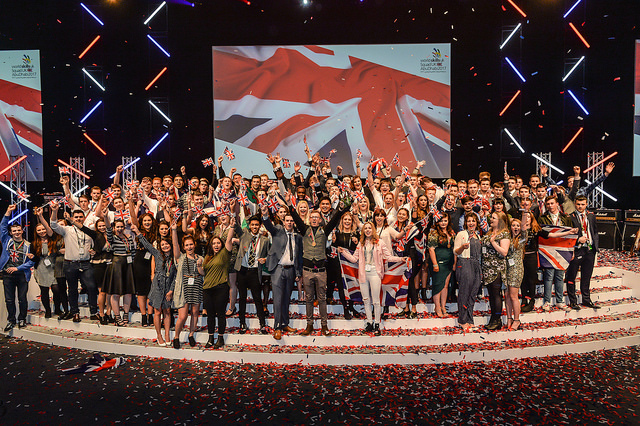 These 200 people, who were selected on the basis of their success at UK Skills 2015 and 2014, will begin training with the aim of representing Team UK at WorldSkills Abu Dhabi in October 2017. The results of the bricklaying, roofing – slate and tiling, and plastering competitions have not yet been announced. According to Find a Future, the competition organisers, the delay was because “it will be necessary to re-verify the results of these competitions”. The winners in these competitions are expected to be announced on Wednesday (November 25). We at WorldSkills UK Scotland are pleased to see two of our Scottish colleges City of Glasgow College and New College Lanarkshire among the top ten medal earners at this year’s Skills Show 2015.